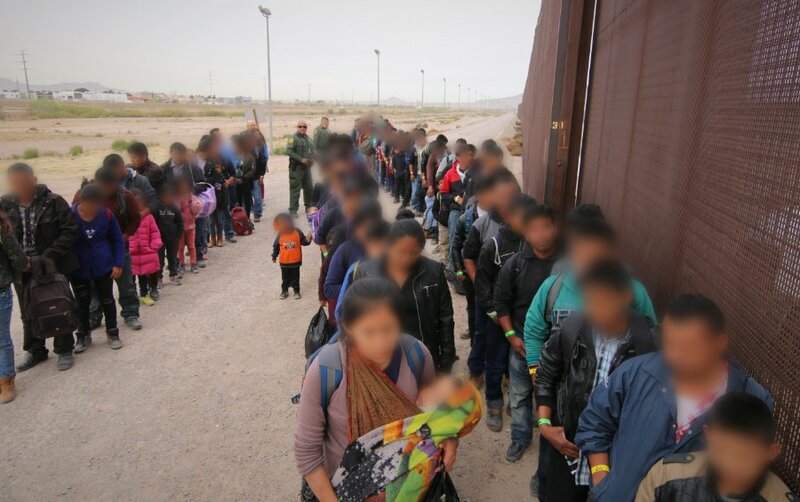 U.S. Border Patrol agents assigned to El Paso Sector, El Paso Station intercept a group of approximately 127 migrants on March 7, 2019. Migrant apprehensions at the U.S.-Mexico border have reached their highest in over a decade, causing what the Trump administration has dubbed an “emergency crisis.” Unlike years prior, the vast majority of the foreign nationals currently trying to get into the country hail from Central America and belong to family units. Originally intended to manage mostly adult, Mexican men traveling alone, the U.S. immigration system has buckled under the weight of Central American families and unaccompanied alien children arriving at the border — many of them actively seeking out border agents and immediately requesting asylum. A major motivation for migrants to make the dangerous trek across Mexico has been the U.S. media frenzy over child separation. Instigated from the Trump administration’s “zero tolerance” policy, the directive forced thousands of children to be separated from their families and invoked outrage from progressive groups. After President Donald Trump ended the separations by executive order, locals in Central America took it as a sign that, if one arrives with a child, they are more likely able to stay. “We know people who left just last month and are already in the United States and working,” Agustín Marcos, a 44-year-old Guatemalan citizen who is considering leaving, said to The Guardian. It’s not only cheaper if he brings his daughter, according to Marcos, but he feels it will increase his chances of getting into the U.S.
“On my own, [the smugglers will] charge me $11,700, but if I go with her, it’s $5,200 for both of us and it’ll be easier to get in,” he said. El Profe, another client recruiter, offers his clients a range of travel options for getting across Mexico. His packages range from $11,000 to $7,800 and can even go cheaper if migrants are willing to take routes that are notoriously deadly. For human smugglers like Germán and El Profe, business is booming. If current trends continue, roughly 1 percent of Guatemala’s and Honduras’s population will have reached the U.S. by the end of 2019.